The online version of this article (doi: 10.1007/s11904-016-0325-9) contains supplementary material, which is available to authorized users. We thank Drs. Badara Samb and Martina Brostrom from the Joint United Nations Programme on HIV/AIDS (UNAIDS), Geneva, Switzerland, for their critical review and advises on this manuscript. Dr. Nachega receives research grant support from the National Institutes of Health/National Institutes for Allergy and Infectious Disease, the AIDS Clinical Trial Group (ACTG)/Stellenbosch University Clinical Trial Unit (2UM1AI069521-08); the US President Emergency Plan for AIDS Relief (PEPFAR; T84HA21652-01-00) for Medical Education Partnership Initiative; the Stellenbosch University Collaborative Capacity Enhancement through Engagement with Districts (SUCCEED; 1 U2GGH001536-01); and the Wellcome Trust Southern Africa Consortium for Research Excellence (WT087537MA). Dr. Altice is funded by the National Institutes on Drug Abuse for Research (R01-DA 10186; R01-DA 13805; R01-DA 017072). Dr. Uthman acknowledges support from the FAS Marie Curie International PostDoc (2012-0064). 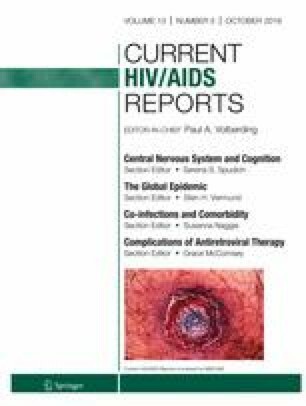 Opinions expressed in the present manuscript are solely from authors and not from NIH, PEPFAR, WELLCOME TRUST, WHO, or UNAIDS. JBN and EJM conceived the review. JBN, KP, and OA drafted the protocol. OA and JBN conducted eligibility of the searches and researched the data. JBN, OA, OAU, and AWK drafted the manuscript. The paper was revised critically for intellectual content by all the co-authors and gave final approval for publication. Jean B. Nachega receives research grant support from the National Institutes of Health/National Institutes for Allergy and Infectious Disease, the AIDS Clinical Trial Group (ACTG)/Stellenbosch University Clinical Trial Unit (2UM1AI069521-08); the US President Emergency Plan for AIDS Relief (PEPFAR; T84HA21652-01-00) for Medical Education Partnership Initiative; the Stellenbosch University Collaborative Capacity Enhancement through Engagement with Districts (SUCCEED; 1 U2GGH001536-01); and the Wellcome Trust Southern Africa Consortium for Research Excellence (WT087537MA). Olalekan A. Uthman acknowledges support from the FAS Marie Curie International PostDoc (2012-0064). Frederick L. Altice is funded by the National Institutes on Drug Abuse for Research (R01-DA 10186; R01-DA 13805; R01-DA 017072). Kredo T, Ford N, Adeniyi FB, Garner P. Decentralising HIV treatment in lower- and middle-income countries. Cochrane Datab Syst Rev. 2013;6:CD009987. doi: 10.1002/14651858.CD009987.pub2. Review.